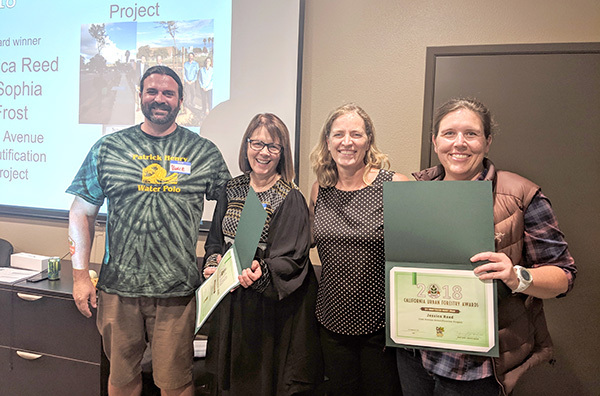 The California Urban Forests Council (CAUFC gave statewide recognition to the Allied Gardens Grantville Community Council (AGGCC) and members Jessica Read and Sophia Frost during an awards ceremony on Oct. 26. The project planted nearly 60 trees along Zion Avenue, completely transforming one of the gateways into Allied Gardens. As these trees grow, they will help calm traffic, provide the community with shade, beauty, and a host of environmental and social benefits. While the City of San Diego planted the trees, there is still a need to water them. Many of the residents along Zion Avenue have volunteered their time to water the trees adjacent to their homes. Frost, Read and the rest of the members of the AGGCC volunteer their time to water the trees, ensuring their survival especially during this summer’s long dry spell. An avid bike rider, Read has met the challenge by using her bike and a small trailer to transport gallons of water to provide to the trees. This endeavor was assisted by Councilmember Sherman’s office by providing funding to purchase “gator bags” for many of the trees. These green bags are fitted to the base of the tree and allow up to 15 gallons of water to slowly percolate into the soil, watering the trees slow and deep, helping encourage proper root development. The urban forest in the Allied Gardens community is starting to show its age, with many trees recently requiring removal. Actions by citizen groups like AGGCC help ensure the city does its part and gets trees back in the ground when they are removed. The Zion Avenue Beautification project also provided inspiration for others in the area, including the creation of an urban fruit forest at Ascension Church’s community garden. Residents interested in taking advantage of the city’s free tree program can request a tree to be planted by the city by signing up at sandiego.gov/blog/free-tree-sd. For more information on urban forestry visit caufc.org, sdrufc.com, or contact District 7 Community Forestry Advisory Board member Vince Mikulanis at vince.mikulanis@davey.com. The American Association of Retired Persons (AARP) Foundation is looking for people who are good with numbers, people or computers — or all three — to work as tax aides for the upcoming tax season. Tax year 2018 will present volunteers with new challenges because of major changes to the tax code. Volunteers will be trained on how to prepare basic tax returns and learn about all the tax deductions and credits that benefit eligible taxpayers. You don’t need to be an AARP member or be a retiree to volunteer. This free program is available to any and all persons. Each year from Feb. 1 through April 15, trained AARP tax-aide volunteers prepare federal and state tax returns for low- and middle-income taxpayers, with special attention to those aged 60 and older. AARP Foundation tax-aide volunteers receive training, including tax preparation training and IRS certification prior to working with taxpayers. This training is free and takes about two weeks early in January. All documentation is provided and computers are loaned for the duration of the tax season. AARP Foundation is particularly interested in wheelchair-bound volunteers as well as Spanish-speaking volunteers. Interested persons should visit online at aarp.org/taxaide, or call Ray Smith at 619-583-6685. Volunteers must sign up by Dec. 15 to become IRS-certified in time for the 2018 tax season. Alvarado Hospital’s new Senior Care Specialty Services Department received the final clearance to open, and began receiving patients on Nov. 5. The new department completed its final comprehensive survey by the California Department of Public Health on Oct. 30. Senior Care Specialty Services is a dedicated geriatric behavioral health program that provides cognitive, emotional, and behavioral care in a secure, 24 hours a day inpatient setting to address both medical and behavioral health needs of senior citizens. Seniors 65 years and older who suffer from behavioral health issues that may be compounded with medical or neurological problems, such as Alzheimer’s or Parkinson’s disease, can receive comprehensive treatment by Alvarado’s team of physicians, psychiatrists, nurses, and therapists. For more information about the Senior Care Specialty Services program at Alvarado, call 619-229 7307. Being a member of a Crusaders Soccer Club team is more than just playing on that team. Working with younger players is also part of the program. 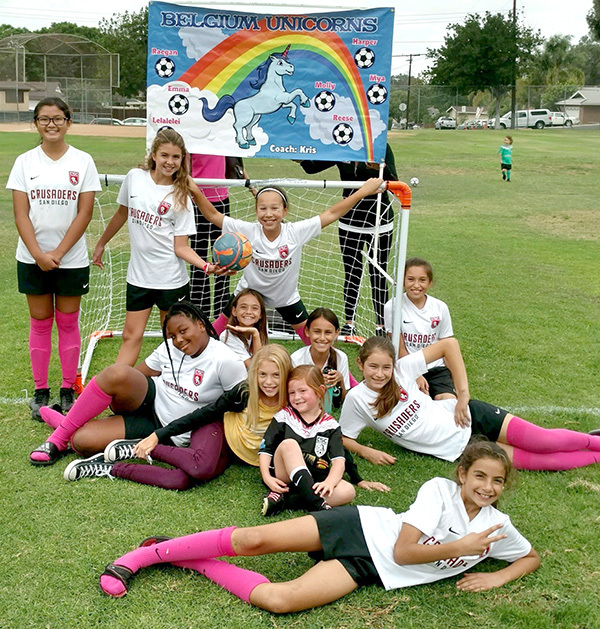 Recently, members of coach Jim Miller’s Girls 2007 Competitive Division team visited his granddaughters’ Girls 2012 Recreational Division team, the mighty Belgium Unicorns. Coach Miller’s team held a special practice and clinic for the young Belgium Unicorns team members and followed up by attending one of the Belgium Unicorns games to cheer them on. The Thanksgiving Soccer Clinic will be held Nov. 19, 20 and 21, 8:30–10:30 a.m. at the Pershing Middle School fields. Players will learn the proper techniques and skills to become a better soccer player. The Recreation Division Camp is for boys and girls born between 2006 to 2012 and the Competitive Division Camp is for players born between 2007 to 2010. The cost is $65 for Recreational Division players and $100 for Competitive Division players. Visit sandiegocrusaders.com to register and for more information. All players attending should arrive wearing a shirt, shorts and soccer shoes and bring plenty of water. Parents/guardian will need to sign each player in at the beginning of the camp on Nov. 19. The fall season for Crusaders Soccer Club ends on Saturday, Nov. 17. On Sunday, Dec. 1, registration will open up for the Crusaders spring season which will commence on Sunday, March 3. Games are played on Sunday so as not to conflict with Little League, Patriot Baseball League and Navajo Girls Fastpitch Softball. The season consists of eight Sunday games with no games on Easter Sunday. Registration includes a uniform consisting of shirt, shorts, socks and insurance. Jersey Mike’s in the Vons shopping center is a continuing sponsor for Crusaders Soccer Club’s recreational and competitive programs. Visit sandiegocrusaders.com for more information about the club. The OMBAC Wallabies, which touts itself as “the premier youth rugby club in San Diego,” is getting underway with its youth club season for boys and girls under 8- and under 14-year-old leagues. The club has international, certified coaches and welcomes all interested players, regardless of experience. Practices are Tuesdays and Thursdays at 6 p.m. at Little Q within the SDCCU Stadium facility. Team matches are played in January through mid-March. Rugby is the fastest-growing youth sport in America and a 2016 addition to the summer Olympics. Visit ombacwallabies.com for more information. 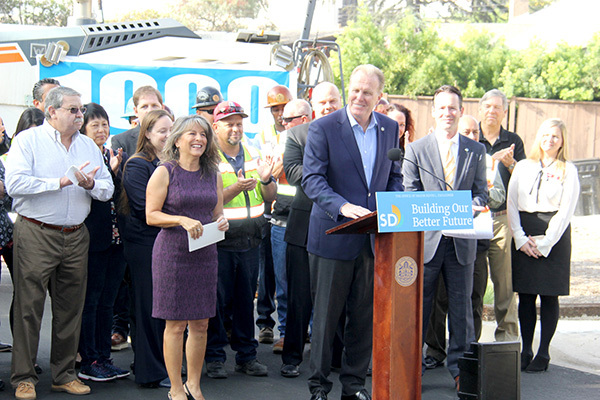 On Monday, Oct. 29, Mayor Kevin L. Faulconer and City Councilmembers Mark Kersey and Lorie Zapf announced that crews have fixed 1,000 miles of streets in a three-year period. Back in 2015, the mayor pledged to meet this goal within a five-year time span. The mayor’s infrastructure goal for the city was achieved two years ahead of schedule, which set a record pace for street repair. Currently, the city fixes approximately 25 miles of streets in an average month. Ten years ago, the city only repaired this number of miles in an entire year. Many factors contributed to this accomplishment, including tripling funding for road repair, rotating street crews to each council district to fill potholes, and expanding the city’s infrastructure program. “With the help of the City Council’s first-ever Infrastructure Committee, we’ve cut bureaucratic red tape and prioritized funding to put neighborhood road repairs first,” added Councilmember Kersey, who is also the chair of the council’s Infrastructure Committee. For more information about the repaired streets, visit streets.sandiego.gov.